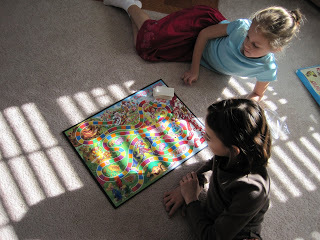 After eating breakfast, making the requisite Monday morning trip to Publix, and stirring up a batch of cookies to share with an older couple in our neighborhood, we started our game day with a throwback to their earlier childhood – Candy Land. We hadn’t played this game in a long time. I realized again how much nicer it is to play games with our girls at these ages as their reactions to losing aren’t quite as emotional as they once were. 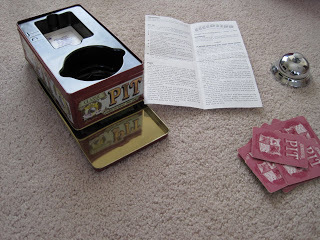 Next came Pit, the classic card game of trading commodities. I didn’t know that our daughters would understand this game, but I obviously underestimated them because they did quite well. I think, however, that their favorite parts were ringing the bell and trying to out yell each other when calling for trades! Throughout the rest of the day, whenever I declared it was game time again, their choice was Pit. We even had to play a few rounds with my husband after supper. It turned out to be quite fun, interspersing a few chores, piano practice and outside time with playing games. Growing up, we often had a family game time on Friday nights. With the girls getting older, I’m looking forward to doing something along those lines myself. Does your family enjoy games? What are your children’s favorite games to play? Which ones work best for playing as a family? I look forward to finding new games to try! I have never heard of Pit. Obviously your girls liked it! We are still stuck in Candyland mode! Other favorites are Connect Four, Hi Ho Cherry-O, Operation and Go Fish. CandyLand is a favorite in our home. We also found a game called Armor of God, which is like trival pursuit but there are no questions to answer. We also love Sorry, and toss up. Blessings! I LOVE Pit! My parents, 4 adult siblings and 2 spouses all play this game together and it gets really loud and competitive! So much fun! We have played this game as a family since we were kids and it has always been so much FUN! I can't wait until my daughter gets old enough to play games (she's only 7 months) because my husband and I love board games. We have played Pit several times with friends who have had it. It is fun! 😀 We just recently got Ticket to Ride for CHRISTmas. It is a fun game! !